The second release from the Dwarfs of East Agouza is a hypnotic journey through sonic vistas which grabs twirls and tosses the listener in all directions. 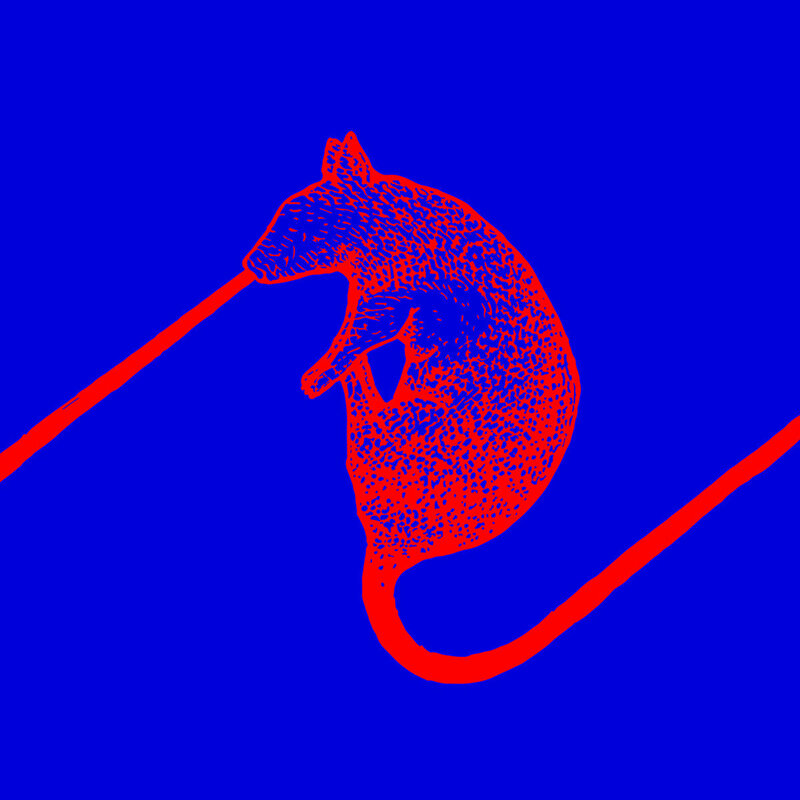 Rats Don't Eat Synthesizers is a pairing of two excursions each running long and allowing the traveler to unfold into the sound, but never without a musical challenge. The group is a three piece from the Agouza district in Cairo, Egypt, the trio consists of Alan Bishop (Acoustic Bass & Alto Sax), Maurice Louca (Keyboards & Drum Machine) and Sam Shalabi (Electric Guitar). The players manage to lock in and circumvent hypnotic passages with scratching tribal and cosmic diversions. The opening title track falls into a rhythmic groove around the four and half minute mark as Shalabi's thin guitar lines catch a groove as Louca's keyboards answer the call all around the steady bass of Bishop. That groove continues to the close with various accents and guitar lines manage to bang about, creating a sweet ride towards the end, which manages (like the beginning) to fall into shambles as it wraps up. The second track on the album and the longer side of this two song offering is "Ringa Mask Koshari" and it takes it's time to get rolling with an avant-garde intro of clanging and space. There is an emptiness to the opening that delivers a sense nothingness as random passages float through. Around six minutes in the percussion/drum machine kicks in as does the skittering saxophone and muscular electric guitar riffs to give the track some energy. The squawking and eeriness of the keyboards play counterweight to the rhythmic guitar lines and percussion as the song grows. A sense of chaos arrives around fourteen minutes as the stakes rise and all contribute to the maelstrom as the sense of adventure gorgeously pulsates until the eighteen and a half minute mark before losing steam and moving into electro bursts and warbles to wrap up the ride. Dwarfs of East Agouza's Rats Don't Eat Synthesizers is a fulfilling listen for fans of experimental sounds and grooving long hauls. Like our favorite electric offerings from this months focus in The Masters series Miles Davis, the pulsing full band organism can fly higher than the individual parts.